I puff my chocolate… I find I get more out of it that way~! Does that sound interesting to you? It might be… Read more and I’ll tell you about it. OK… here’s the deal. Chocolate is a non-negotiable for me… come hell or high water, I’m still gonna find a way to eat chocolate, and the more, the better. That’s where the Puffing comes in. 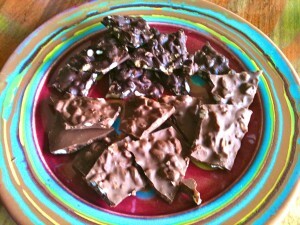 This is how I make my chocolate “bigger”… I add bulk by adding Kashi 7 Whole Grain Cereals Puffs. I haven’t figured out the exact proportions yet. I do it by texture. I add as much puff to my chocolate as I can while still maintaining the snap, bite, and flavor that I like from my chocolate. I’m not sure if I am making my chocolate go 2x as far… but it is close. It is almost like having DIET chocolate… LOL… fiber and nutrition, fewer calories per ounce. My most recent chocolate adventures have been an ancho bacon milk chocolate, which I make by making my reduced fat turkey bacon EXTRA crunchy by cooking it in the microwave, and adding that with some smoky ancho chile powder. I like it hot, so I add my pepper powder to suit my own taste buds. Yum~! Very wonderful rich flavor… Yes, I puffed it so I can feel like I am eating more chocolate every time I grab my stash~! And… I made more of my Crispy Chewy Chile Cherry Cashew Chocolate… Cayenne pepper in this batch…. and of I course bulked it up with Kashi puffs. I use chopped cashews, and SOUR dried cherries. One Response to I PUFF MY CHOCOLATE…. Wow…this sounds like a great idea! …since I love chocolate too!